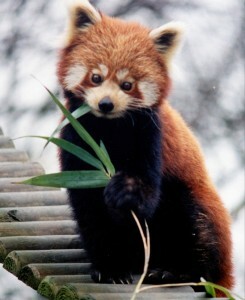 Red Panda, the state symbol of Sikkim, is currently classified as Vulnerable due to excessive poaching. Conservation efforts in each state could be focused around the wildlife symbols of that state for maximum effect. It is quite possible that you know the national symbols of India. 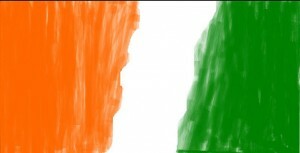 You may know that the National Animal is the Tiger, the national tree is the Banyan Tree, the national bird is the Peacock and the national flower is Lotus. You may, perhaps, also be aware that the Gangetic Dolphin was recently declared the national Aquatic Mammal of India. However, you may not be aware of the symbols of the different states of India. I wasn’t too, and the information available online was not properly referenced. So, I decided to take advantage of the wiki setup we had with the Biodiversity of India website and compiled an exhaustive, well-referenced list of various state symbols. What can this list be used for? Well, for starters, it is an educational resource. Teachers can quiz their children on various state symbols and ask them to describe each one of them, draw their pictures and research deeper on where they are found in their state. This list can be used by amateur conservationists, to generate awareness among the common man for conservation of these species. Conservation efforts over the past several decades have shown that if we project a certain flagship species – Tiger in India, Elephant in Africa, Orangutans in Indonesia – and create a movement for their conservation, countless other species also get saved in the process. The same strategy can be used in each state in India, by creating a movement around the state symbol. The entire list of the official state symbols of India can be accessed here: Official flora and fauna of Indian states. The Warlis or Varlis are an Adivasi tribe living around the Maharashtra-Gujarat border. The Warlis have traditionally worshiped nature and have their own animistic beliefs, customs and traditions. 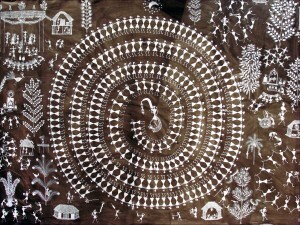 The Warli people are famous for their beautiful and unique style of painting which reflects the close association between human communities and nature. It is thought that the Warli culture goes back to the 3rd century BCE, although there is no hard evidence for it. It is true however, that the community has been living in the Thane district of Maharashtra for a really long time and call the forests in those regions their home. Over the years, they have made subsistence on agriculture, animal husbandry and collecting forest produce and it is through these activities that they have developed very close associations with nature. This association comes out through their drawings, which are quite simplistic in fashion, yet provide a great deal of information about how the Warli community lives and probably, our ancestors lived thousands of years ago. Pashupati, the Lord of Living Creatures, is depicted in many seals found in IVC. It is believed that Pashupati later evolved into Lord Shiva in the Vedic civilization. The states of Punjab and Sindh in Pakistan and Punjab, Rajasthan and Gujarat in India had a great river named Saraswati (now the Ghagra Hakra river) flowing through their lands, four thousand years ago. The world’s first large civilization – the Indus Valley Civilization – arose on the banks of the Saraswati and the Indus rivers. 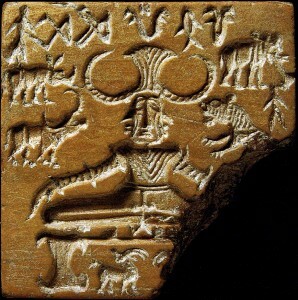 At its peak in 2000BC, cities of the IVC such as Harappa and Mohenjo Daro housed over two hundred thousand people. The civilization was thriving – it had culture, a symbolic language, trade, city planning and a central rule of law. However, the civilization mysteriously vanished around 1500 BC. Hundreds of thousands of people disappeared, cities were lade bare and large swathes of land turned into deserts. Very few traces of this civilization are to be found in the next stage of India’s history – the Vedic civilization. What happened to all the people of the IVC? Why did such huge cities crumble to dust? Although several hypotheses have been proposed to address one of the biggest historical mysteries of all times, one leading explanation involves the role of climate change. Many experts today believe that the IVC disintegrated after the Saraswati river started turning dry. Satellite imagery of the region along the Indo-Pakistan border clearly shows existence of vast underground channels where the mighty Saraswati once flowed. Most currently known sites of the IVC line perfectly along these channels, suggesting that these massive cities propped up along the banks of Saraswati. It is also believed that there was a general weakening of the monsoon system around 1500BC. It is believed that hordes of people migrated from the IVC and went towards the Gangetic plains or to Central Asia. Research has also shown that the new centers of activity arose east of the Saraswati a few hundred years after the Saraswati dried up. Species such as the Great Hornbill in Arunachal Pradesh are threatened today. Human civilization has existed in India for the past fifty thousand years – ever since the first pre-humans migrated out of Africa and proceeded towards the southern coastline of India. Millions of migrants and conquistadors have since entered India through the northwestern frontier. Most decided to stay here – the country had plentiful rivers, a beautiful landscape, fertile soil and an amazing biodiversity. The cultural evolution over the past two thousand years saw much of this nature get integrated into the lifestyle of the people. Right from having gods bearing pythons and elephant heads to finding medicinal uses of leaves and roots, from worshiping the rivers as deities to considering the earth as the Mother (Dharti Mataa), India’s nature got richly integrated into its culture. India, not just the country, but also the concept, exists because of its nature. As the example of the IVC shows, you destroy India’s nature and you’d have disintegrated its civilization. This scenario is no longer a historical, or for that matter, a futuristic one. It is very much a problem this generation and the generations to come have to deal with. Climate change today is a reality. According to several scientific reports, India and its 1.5 billion people and countless species will be among the worst affected by climate change. Himalayan glaciers, for example, provide water to one third of the world’s population. These glaciers are the sources of our rivers like the Ganga, the Indus and the Brahmaputra. What happens when the water starts running low? On the other side of the country lie the mighty Western Ghats. Rivers like the Cauvery and Krishna have their sources in the Western Ghats. These megadiverse ranges are the most human-inhabited biodiversity hotspots in the world. Predictions suggest that changing patterns of the monsoon winds will significantly change water availability and the ground water table in these regions. What will that mean for the people living in these areas? How will it affect the rich flora and fauna? Questions like these are no longer hypothetical but very much a reality. This is no longer a time to take petty, superficial actions and put a plaster over the developing cracks. We are no longer dealing with petty issues like bringing CO2 emissions down to pre-1990 levels or signing nominal accords with foreign countries. We are certainly not dealing with petty divisions of language, caste and religion. We are at one of the biggest crossroads of the Indian civilization today. The scenario is much the same as what the people of the IVC faced four thousand years ago. We can either let the India of today degenerate into chaos or we can take bold actions with a sense of urgency. The kind of India our children inherit tomorrow is very much dependent on what action we take today. That is what we must all realize. Today, as we celebrate our 66th Independence Day, it’s important to note that India is an unlikely country, a nation that should not have existed! India is the oldest continuous human civilization in the history of this world. Our history dates back to ~4000 years BCE and some of the traditions established in Harappa and Mohenjo Daro (eg: Lord Pashupati who is now Lord Shiva) are still being followed 6000 years hence. On the other hand, other civilizations (excluding the Chinese) such as the Egyptian, Mayan, Incan, Roman, Greek civilizations collapsed, only to remain alive in buried artwork and erected monuments. The other great historical civilization – the Chinese – despite having to experience frequent wars, has enjoyed a relatively high level of stability over the past six thousand years. Most of the fighting in China has been internal and very few external conquerors like Genghis Khan tried to claim China. On the other hand, the Indian civilization has sustained despite centuries of warfare and attacks. the history of India is peppered with foreign invasions – from Alexander, the Great to the British. And despite all this infighting we continue to thrive as a nation. And it’s not just infighting between kingdoms. India has 30 officially recognized languages and 1652 dialects. We have people from three human races – Caucasian, Dravidian, Mongol – living in our country. We have people from almost all major religion living in India. Indians are also divided by an intricate caste system – we have several dozen castes and sub-castes in India. Each state, each linguistic group, each caste, each region has its own cuisine. Some people argue that the human diversity in India is only comparable to the continent of Africa! There are 1.6 billion Indians today, some of them far away from their lands, like me. However, all of us – whether we are from South India or North-East India or North India – are bound by a common cultural experience. India has been overwhelmingly Hindu. 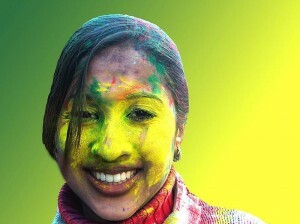 Today, 85% of Indians are Hindu who share deities, mythological stories, customs and traditions. We have all been told of the principle of Vasudhaiva Kutumbakam – the whole world is a family! Hinduism believes in multiplicity of gods and beliefs and thus has offered refuge to any and every religious belief that entered its land. Even Muslims, Christians, Buddhists, Sikhs and Jains had Hindu ancestors at some point or their religions are closely associated with Hinduism. This creates an unparalleled cultural history, an experience which no other nation on this planet can boast of! From its establishment in the early post-Christ years, Islam has grown to become the second largest religion in the world! It has spread from all over the Middle East to Northern Africa to Central Asia to Southeast Asia. However, despite being ruled for 600 years, India couldnt become an Islamic state. Why? People might find some explanations in having large-hearted Mughal rulers like Akbar, whose Sufi leanings helped patch up relations between Hindus and Muslims, or resistance in the form of local Hindu rulers like the Rana Pratap and Shivaji Maharaj. However, an important factor that may have contributed here is the caste system. Members of the lower castes may have been predisposed to convert to Islam in the medieval ages, just like Buddhism. However, the caste relations among communities were so strong that once a religion was associated with a particular strata, the other castes wouldn’t want to embrace it. Even now, there are castes among Muslims and Christians. Despite it being an overall bane for India, the caste system may have unwittingly contributed to keeping India Hindu over the middle ages, thus keeping our cultural memory intact. 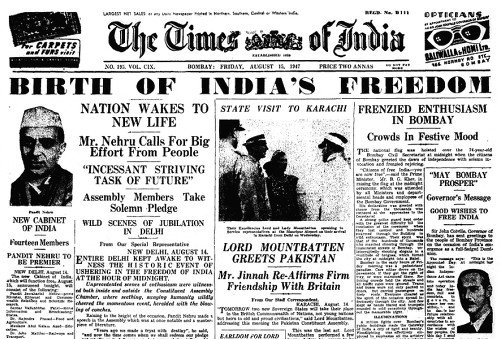 I really think the partition of India was one of the best things that happened to this country. The extremist Muslims of the Muslim League, who couldnt bear to live in a multi-cultural society, who were filled with hatred and were prepared to go to any lengths to split Pakistan from India went to Pakistan, while the moderate Muslims, who realized the fallacy in the Muslim League approach, decided to stay and contribute to India. 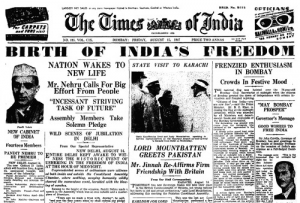 When the Indian National Congress approved the partition plan, Khan Abdul Gaffar Khan (the Frontier Gandhi), an opponent of the partition, famously told the INC, “You have thrown us to the wolves!”. Moderate Muslims like Zakir Hussain, Rafi Ahmad Kidwai and Abul Kalam Azad chose to stay in India. Since the foundation of Pakistan was based on extremism and hate, no wonder the nation had had to suffer such a tumultuous, unstable leadership. For the first time since the Maurya empire 2000 years ago, India in 1947 extended from the Indus river to Myanmar. Some 450 million souls in the 1950s were looking forward with hope. Most of the newly created countries in the past 50 years have suffered extremism and anarchy post Independence – take a look at our conjoint twin Pakistan! India thrived, and one of the primary reasons was a stroke of genius by our founding fathers, especially Dr. Bhimrao Ambedkar! The Constitution of India was a remarkable document, which allowed each linguistic group to have its own identity and its own kingdom. The states were allowed to thrive as semi-independent entities – each given a charge of their own fortunes and fates. This remarkable division may have stopped several more decades of infighting between linguistic groups. The chaotic democracy in India offers voice to thousands of ethnic and community interest groups in the country. The Emergency of 1975 as well as the mini-uprising post Anna Hazare’s unceremonious arrest in 2011demonstrated the enormous importance Indians place in democracy. Despite the pitfalls of the system, despite corruption, democracy is a thread that binds every Indian together now. The value we place in democracy has increased many folds over since the advent of the Internet, with government’s efforts to curb Internet freedom and the ease of propagation of information and ease of organizing over the web. The four pillars of our democracy – Legislative, Executive, Judiciary and Press – have severe endemic problems, but there are enough good people at every level in the system to keep it running efficiently. The role of NGOs – the 5th pillar of our democracy – has been crucial in this regard. Representation of the common man wouldn’t have been possible in absence of a democratic society. Today, as we celebrate the 66th Independence Day, India is fraught with problems. The problems are compounded by an ever-burgeoning population, limited resources, climate change and destruction of our natural heritage. We cannot rest on the laurels of our past successes. Today, we are proud of our country because our ancestors strove to leave a country fit for their future generations to live. The challenges of this generation are enormous, but we must also strive to leave our children and our grandchildren a better India. Ganga Maiyya or world’s largest open sewer? I read an obnoxious article on Tehelka.com recently on the River Ganga (Ganges). The investigative report found that Ganga today is more polluted than when the Ganga Action Plan was launched in 1985 to, ironically, reduce the level of pollution in the river. Just how polluted is the river? Near Haridwar, coliform bacteria, which cause diseases like gastroenteritis and diarrhoea, are present at a concentration of 5500 mpn/100ml. The permissible levels are 50mpn for drinking, 500mpn for bathing and 5000mpn for agriculture. Such high concentations are because the 12 municipal towns located on Ganga’s banks from Gangotri to Haridwar release around 90 million litres of sewage, urine and faeces into the river every day. Near Kanpur, the river turns toxic due to industrial sewage disposal. Despite repeated awareness campaigns against tanneries, they release about 40 million litres of effluents/day of which only 9 million litres is treated. These effluents contain chromium at a concentration of 248 mg/litre, when the WHO limit for drinking water is 0.05 mg/litre, a shocking 5000X higher concentration!! Chromium toxicity can cause a wide range of problems, from allergic reactions and dermatitis to cancer and dementia. Near Varanasi, around 300 tonnes of half-burnt carcasses, corpses and ashes are thrown into the river each year. Coliform bacteria are present at 2 lakh mpn/100ml. Of the three sewage treatment plants, two are not operational. Near Patna and Kolkata, the situation is the same – extremely high amount of coliform bacteria, huge volumes of industrial effluents and skyrocketing concentrations of toxic compounds! The Gangetic basin is the most heavily populated basin in the world, supplying water to 400 million people! Ganga provides water to 40% of India’s population in 11 states. This water is used for everything – cooking, drinking, washing clothes, agriculture, bathing…everything! A study found that 66% of the families near Varanasi were affected by diseases like cholera, dysentery, Hepatitis-A, Typhoid etc. The pollution has threatened more than 140 fish species, 90 amphibian species and the Gangetic River Dolphin. 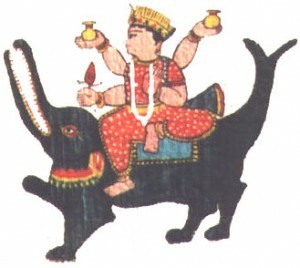 The latter dolphin species, which is considered the vehicle of Goddess Ganga, is almost extinct. Hindus believe that bathing in Ganga will wash away all your sins. “Ganga consumes all your sins and still remains pure…that is why it is divine”, they say. I would suggest forcing numb-nuts who make such arguments drink the water of Ganga for a week. Such capital punishments should also be meted out to owners of industries which release effluents in the river. Without a few strong, well-publicized cases of repugnant action, we will never be able to bring Ganga back from the dead. No amount of awareness campaigns will work. Ganga has soaked our sins for the past four thousand years, however, we have effectively managed to KILL IT in the past fifty years alone!